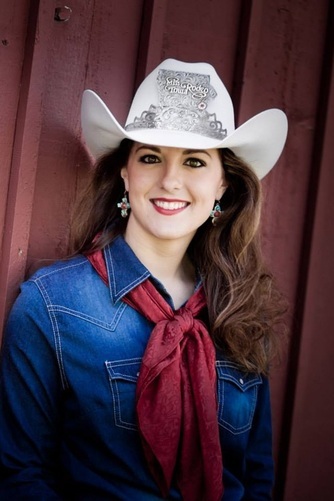 A true small town county girl kicking her boots off in Winterset, Iowa, Hannah graduated from Winterset High School and received Bachelor of Science degrees in Agricultural Education with a teacher certification and Animal Science with an equine option from Iowa State University. She is the 22 year old daughter of Stacy Hilsabeck. Hannah grew up on a hobby farm and was very active in 4-H and FFA showing: rabbits, sheep, pigs, cattle, and horses. It was here that she fell in love with horses and joined an equestrian drill team, Central Iowa Dancing Hooves, and traveled with them for 3 years. In 2011, Hannah moved to Estes Park, CO, and was a horseback guide on trail rides through Rocky Mountain National Park and Roosevelt National Forrest with SK Horses, Inc. She has also worked for the Iowa State Fair Entry Department as the equine specialist and horse barn office manager. While her favorite activity remains just trail riding at home, she has also held many previous rodeo queen titles including: 2007 Madison Co. 4-H Jr. Cowgirl Queen, 2008 Winterset FFA Senior Cowgirl Queen, 2009 Abdallah Shrine Rodeo Queen, 2009 Dallas Co. Fair Rodeo Queen, Miss Teen Rodeo Iowa 2010, and Miss Sidney Iowa Rodeo 2013. Hannah enjoys spending most of her time with her friends and family and loves the outdoors. She was a competitive gymnast for 13 years and has since taken up coaching youth gymnastics. While in high school she was involved in speech and debate, pep club, National Honor Society and was a varsity football and competition cheerleader. In college, she spent most of her time volunteering and working at the University Horse Barn.